Krakow is Poland's second largest city, and it's a popular tourist destination in the country. It attracts tour groups, independent travelers, and solo travelers alike for its rich history, impressive culture, and vibrant nightlife. There are plenty of affordable places to stay as a solo traveler in Krakow. 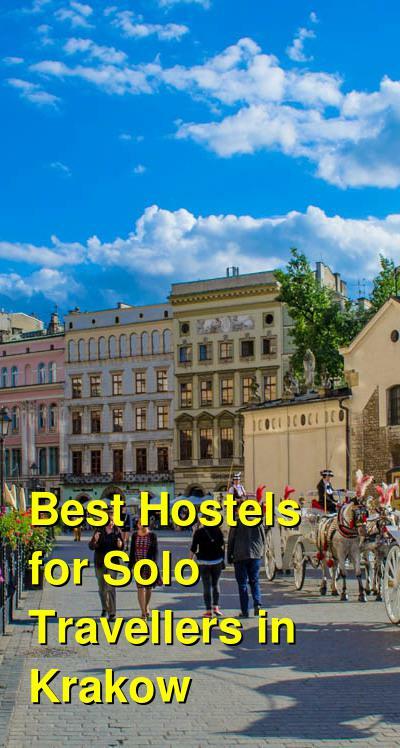 How much do hostels in Krakow cost? Let's Rock Hostel is a popular option in Krakow. If you're looking for a party hostel with a social environment, then this is the place for you. It's located right in the middle of the city's nightlife scene, so it's easy to make your way back to your room after a late night out on the town. The hostel hosts all kinds of events including vodka tasting, sangria nights, movie nights, karaoke, and pub crawls. There's also a bar onsite, if you don't want to venture out too far. Looking to lounge around after a late night? The hostel's common area is the perfect place to relax with other guests in a low key environment. The hostel is conveniently located between the Wawel Castle and the main square. It's easy to reach many activities, attractions, restaurants, and bars. There are a variety of amenities available to guests including free breakfast, lockers, walking tours, a fully equipped kitchen, and wi-fi. Rooms range in size from twin private rooms to 12 bed dorms. This hostel is perfect for solo travelers who want a lively place to stay. It's a party hostel, and there are always other travelers around who are looking to go out and experience the city's nightlife. You'll never be at a loss of things to do if you stay at Let's Rock Hostel. Greg & Tom Hostel is a longstanding favorite in Krakow. The hostel remains one of the most popular places to stay in the city and it's not hard to see why. It's conveniently located, just a ten minute walk from Market Square and St Florian's Gate, and is easily accessible to most of the city's top attractions. The staff at the hostel is friendly and welcoming. They regularly organize events to help guests get to know each other. These events include nightly dinners and walking tours. Weekly events include drinking games, video game nights, movie nights, and game nights. An impressive free breakfast is also available. If you're really looking for a party, there is also an affiliated "party hostel" located just five minutes away. The hostel also has a variety of amenities including three fully equipped kitchens, large dorm rooms, plenty of common space, and all kinds of travel information. If you're traveling alone and want to meet other guests, then this is one of the best places to stay in Krakow. Another top party hostel that's popular with solo travelers and groups alike is Pink Panther's Hostel. If you're looking to make some new friends and have a good time, then this is the place to stay. They host a "Royal Pub Crawl", which takes guests to all the best drinking spots around town. The hostel hosts a variety of events including wine evenings and beer pong. Not all of the activities are centered around alcohol, but if you're looking for a quiet environment, then this is probably not the place for you. The hostel is conveniently located near the Market Square. It's also easily accessible from the central train station and is surrounded by Krakow's famed Old Town. The hostel has a lot of common space where guests can hang out and get to know each other. There's a living room and shared kitchen. There's also wi-fi, lockers, and tourist information available. If you're traveling alone and want to meet other travelers looking for a good time, then this hostel is a great option at a reasonable price. Atlantis Hostel is a large hostel in Krakow that is popular with young travelers. It's located in the heart of the city and is convenient to most of the city's top attractions and activities. The hostel is an affordable option for those on a budget, but it's popularity also means there are plenty of people around that you can hang out with. The rooms range in size and include doubles, triples, quads, six bed dorms, eight bed dorms, and ten bed dorms. Room types include both "basic", for those on a tighter budget, and "deluxe", for those with a little more money to spend. Whether you're traveling with a group of friends or alone, this hostel has a great and welcoming environment.